My second tier recommendations are comprised of common and lesser known dietary supplements. Just about everyone is familiar with the health effects of calcium supplementation. Coenzyme Q10 and probiotics have also made strides in popularity in recent years. But, supplementing with concentrated blueberry extracts and full spectrum Vitamin K is still relatively rare. Calcium Citrate - The bone strengthening benefits of calcium have been widely publicized for decades. But, a recent publication in the journal Health Reports reveals that calcium insufficiency is still surprisingly widespread. An analysis of more than 28,000 women over the age of 50 indicates that up to 69% failed to reach the recommended daily intake (1,200 mg/day) of this essential mineral. This is particularly alarming when you consider that more than 19% of women over 50 are diagnosed with osteoporosis. I frequently suggest using calcium citrate because it’s affordable, easy to find and doesn’t have to be taken with meals. This later point allows for greater compliance and flexibility of use. Coenzyme Q10 - The scientific data on CoQ10 is both impressively consistent and incredibly far reaching. I recommend it to clients with conditions ranging from fibromyalgia to gingivitis. But, by far, the best documented use of CoQ10 is to support cardiovascular health. The October 2011 issue of the journal Atherosclerosis reports that CoQ10 promotes heart health, in part, by improving endothelial function. The resulting effect is improved blood flow, lower blood pressure and protection for the arteries. While the reputation of CoQ10 is solid, there is some controversy about which form is superior. The most common and best researched variety is known as ubiquinone. An active or reduced form with greater bioavailibility (ubiquinol) may be more potent under certain circumstances. More research is needed to clarify which form or combination of forms is optimal. Blueberry Extract - Blueberries have garnered a deserved reputation as a genuine brain food. Research from the last few years also indicates that they’re among the top fruits to eat because they actually protect against the harmful effects of elevated blood sugar. This makes them ideal, when eaten in moderation, for diabetics and those with metabolic syndrome. However, since blueberries aren’t always in season, sugar-free blueberry extracts are an excellent alternative that can be taken year round. All told, they tend to be less expensive than eating a daily bowl of blueberries and they appear to yield similar health benefits. Of late, studies reveal that blueberry consumption reduces systemic inflammation and oxidative stress. This purplish wonder food also supports immune function by increasing the number of natural killer cells and probiotics or healthy bacteria in the intestines. Probiotic Supplements - I enthusiastically recommended eating cultured and fermented foods including kefir, sauerkraut and yogurt on a regular basis. Clinical and population-based studies suggest that doing so encourages generalized health promotion for all ages. But, you don’t need to stop there. Over the past decade, researchers have discovered that specific strains of healthy bacteria improve well being far beyond the gastrointestinal tract. The most current evidence informs that probiotics are capable of improving diverse conditions ranging for depression to liver disease. The key is to find clinically validated supplements that have been shown to address conditions that are relevant to you. In the case of depression, that might mean using a supplement containing a combination of Lactobacillus helveticus and Bifidobacterium longum. For fatty liver disease, a commercially available strain known as Lactobacillus rhamnosus GG is worth considering. Vitamin K Complex - Vitamin K is present in two primary forms: Vitamin K1 or phylloquinone is abundant in select fruits and vegetables including avocado, kale and spinach; and Vitamin K2 (menaquinone) is primarily manufactured by intestinal bacteria and found in cultured and fermented foods such as cheese and natto. Like calcium, both forms of K support skeletal health. However, Vitamin K does so in a distinct manner. It helps to retain calcium in bones and discourages it from depositing in arteries by activating a protein known as matrix Gla. Since both Vitamin K1 and K2 have performed well in numerous clinical studies, I typically recommended using lipid-based soft gels that contain both forms. One supplement that did not make my list, but deserves an honorable mention is Biosil. This highly absorbable form of silicon, a trace mineral, supports connective tissue throughout the body that predictably declines with age. The product is available in an encapsulated and liquid form. The latter has an unpleasant odor and taste, but it can masked by taking it in strong tasting beverages such as sugar-free lemonade or pure cranberry juice. This is a good refresher to prepare our mind to contribute by assisting the body to benefit from the properly chosen supplementation! Thank you, Paul. That’s a very important point. Being mindful of what you’re taking and why you’re taking it can improve the efficacy (of any given supplement) in a very meaningful way, IMO. Wow, so much information in one post. I can’t agree more with JP, you have to be mindful of what you are putting into your body. Just because you read somewhere on the internet that this celebrity or bodybuilder swears by this supplement doesn’t mean it’s safe for you. Do your due diligence and find out as much as you can before you start injecting a new supplement. Thank you, Vera. Like you, I’ve seen many questionable endorsements by famous folk. The key is not to get hooked exclusively by the marketing of supplements. If a claim is implied or made, search to see if there’s a reasonable basis for it. If so, go forward with the added confidence that you’ve done your homework. Informed consumers/patients have a big advantage in the health care arena. pretty solid choices here, i would add a pharmaceptical degree fish oil there like ascenta or carlson labs the very finest fish oil and u are ready for everything.the only thing that bothers me right now is the dosage of vitamin d and k since there are so many differnet opinions.recently i considered starting taking a d+k supplement along with calcium sup and i saw a life extension’s one with (5000 iu d3,1000msg k2,100 msg k3) when the fdu proposes upper dose of 135 msgk2/day and 10,000iu d3/day 0o. so i am a bit confused concerning the doses of those 2.. any suggestions pls? UPDATE:my mistake it was 135 mg not mcg as recommended dose but again is life extension’s dosage really safe? I’m not sure if you saw part one of this column? Vitamin D dosage ought to be based on blood test results, IMO. Please take a look at the Vitamin D3 section in the previously linked blog. How much Vitamin K to take is a bit of a guessing game. This is especially true if you’re using it as a preventive measure. Most studies have examined K supplementation in populations with preexisting conditions (ie cardiovascular disease, osteoporosis, etc.) Having said that, I haven’t seen any reliable evidence that higher/therapeutic levels of K1 or K2 are dangerous unless taken by individuals using anticoagulant medications. Presently, I eat a diet rich in Vitamin K and get several hundred micrograms in the supplements I take. my bad, i found this site recently and i was so pleased with the work done here that i started reading randomly so i missed that part i wanted to ask you about a fish oil product that i found recently named:Natural Factors, RxOmega-3 Factors, EPA 1,500 mg / DHA 750 mg which claims to be Pharmaceutical quality.could u share with me ur opinion concerning this product because i think about adopting it instead of taking ascenta neutrasea liquid high epa which is also Pharmaceutical quality but its price is 1.5 times higher.i cant seem to find some really big difference between those 2 and maybe natural factor’s price will raise in the future, right now is a much cheaper choice, but quality comparison is a question.any tips?thx man! First things first: The term “pharmaceutical grade” is strictly a marketing term. That’s not to say that products that use it aren’t good. They’re just misleading, IMO. I’m not a big fan of Natural Factors’s fish oil. But, there are quite a few other concentrated, purified fish oils that will compare favorably with what you’re currently taking re: cost & quality. One example is the fish oil products sold under the NSI/Vitacost brand. Carlson is another good option, IMO. I use Carloson CLO when I cant get my hand on a Fermented CLO. I also usually use Ascenta products because of there quality although at the moment im trying out New Chapters Wholemega fish oil product as I heard good things about it and it seems like a quality fish oil. Thromb Haemost. 2015 Feb 19;113(5). Menaquinone-7 supplementation improves arterial stiffness in healthy postmenopausal women: double-blind randomised clinical trial. Observational data suggest a link between menaquinone (MK, vitamin K2) intake and cardiovascular (CV) health. However, MK intervention trials with vascular endpoints are lacking. We investigated long-term effects of MK-7 (180 µg MenaQ7/day) supplementation on arterial stiffness in a double-blind, placebo-controlled trial. 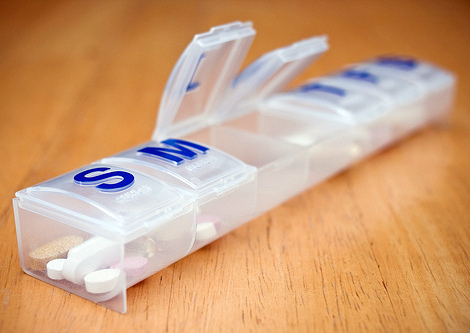 Healthy postmenopausal women (n=244) received either placebo (n=124) or MK-7 (n=120) for three years. Indices of local carotid stiffness (intima-media thickness IMT, Diameter end-diastole and Distension) were measured by echotracking. Regional aortic stiffness (carotid-femoral and carotid-radial Pulse Wave Velocity, cfPWV and crPWV, respectively) was measured using mechanotransducers. Circulating desphospho-uncarboxylated matrix Gla-protein (dp-ucMGP) as well as acute phase markers Interleukin-6 (IL-6), high-sensitive C-reactive protein (hsCRP), tumour necrosis factor-α (TNF-α) and markers for endothelial dysfunction Vascular Cell Adhesion Molecule (VCAM), E-selectin, and Advanced Glycation Endproducts (AGEs) were measured. At baseline dp-ucMGP was associated with IMT, Diameter, cfPWV and with the mean z-scores of acute phase markers (APMscore) and of markers for endothelial dysfunction (EDFscore). After three year MK-7 supplementation cfPWV and the Stiffness Index β significantly decreased in the total group, whereas distension, compliance, distensibility, Young’s Modulus, and the local carotid PWV (cPWV) improved in women having a baseline Stiffness Index β above the median of 10.8. MK-7 decreased dp-ucMGP by 50 % compared to placebo, but did not influence the markers for acute phase and endothelial dysfunction. In conclusion, long-term use of MK-7 supplements improves arterial stiffness in healthy postmenopausal women, especially in women having a high arterial stiffness. Eur J Clin Nutr. 2015 Mar 18. 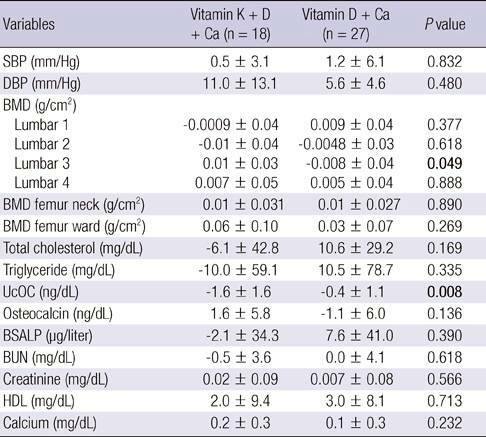 The effect of vitamin K1 supplementation on sensitivity and insulin resistance via osteocalcin in prediabetic women: a double-blind randomized controlled clinical trial. BACKGROUND/OBJECTIVES: A relationship between osteocalcin (OC) levels and factors associated with energy metabolism and insulin resistance has been reported recently. The aim of this study was to investigate whether modulation of ostecalcin isoforms via vitamin K1 supplementation would affect glucose metabolism or insulin sensitivity in prediabetic and premenopause women. SUBJECTS/METHODS: Eighty-two prediabetic women were randomized to consume vitamin K1 supplement (n=39) or placebo (n=43) for 4 weeks. Participants in the vitamin K1 supplement group received one pearl softgel capsule containing 1000 μm of phylloquinone, and the placebo group received one placebo capsule daily for 4 weeks. Blood samples were collected at baseline and after the 4-week intervention period to quantify carboxylated OC (cOC), undercarboxylated OC (ucOC) and relevant variables. RESULTS: Phylloquinone supplementation increased the serum levels of cOC and decreased ucOC, compared with placebo (12.53±5.95 compared with 7.43±4.85 ng/ml and 2.47±1.91 compared with 4.79±2.43 ng/ml, respectively; P<0.001). Furthermore, intake of phylloquinone supplement led to significant decreases in %ucOC (17.97±12.24 compared with 43.80±19.86) and 2-h post-oral glucose tolerance test (OGTT) glucose (7.32±1.50 compared with 8.62±1.45 mmol/l), and 2- h post-OGTT insulin level (80.34±42.24 compared with 112.43±53.19 μIU/ml) and increased insulin sensitivity index (2.46±0.71 compared with 1.75±0.61) compared with placebo. Overall, a significant association was found between changes in %ucOC and changes in 2-h post-OGTT glucose (r=0.308, P=0.028). CONCLUSIONS: The results of this study demonstrated that vitamin K1 supplementation for 4 weeks did not affect insulin resistance in premenopausal and prediabetic women but had beneficial effects on glycemic status and insulin sensitivity.